As accountant at Fort Vancouver in the 1830s and as the chief factor there in the 1840s, [James] and Amelia lived frugally and suffered more than their share of domestic tragedy with the deaths of seven of their thirteen children. Notably, most of the short-lived children were born very early in their long marriage, from 1829 to 1838, when five out of their first six children perished before age 3. Whether this reflects the nutritional and epidemiological conditions at Fort Vancouver shortly after its founding in 1824, or whether this reflects the fact that Amelia was too young and frail as a teenager and young adult to sustain healthy pregnancies and infants, it’s interesting to note in our age of panic over “advanced maternal age” that most of her surviving children were born when she was between the ages of 27 and 42. The experience of losing so many infants and toddlers early in their marriage made its mark on James, who “still recalled theirs as a ‘family of 13,’” rather than a family of six children (168). 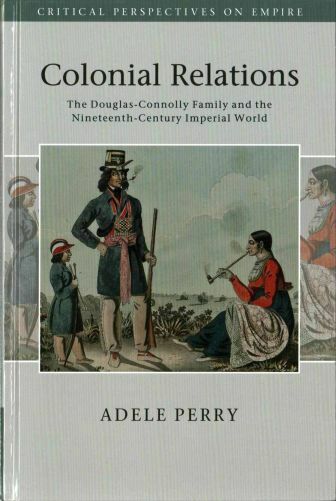 But the fur trade world built on nearly three centuries of intermarriage and the creation of an influential Metis bourgeoisie was coming to a close by the time of the Douglas-Connolly marriage in 1828. James’s rise through HBC ranks was doubtlessly accelerated by his alliance with a powerful and wealthy Metis family (the Connollys), but in a world that was rapidly filling with white Canadian and American women, the position of women like Miyo Nipay and her daughter Amelia was increasingly precarious. Fur trade marriages were usually built on several interlocking hierarchies that privileged husbands over wives—such as the absolute practice of whiter and lighter men marrying darker-skinned women, the fact that the women were frequently young teenagers and the men well into their 20s or 30s (or beyond), plus the access that many men still had to metropolitan marriage in Eastern cities or in Britain and the means to retire into white family life—it nevertheless offered advantages to Metis and First Nations women that patriarchal Christian marriage did not. So Perry argues convincingly that it was significant early on in their “country marriage” in 1837, after a Protestant missionary arrived at Fort Vancouver, that James and Amelia consented to have their union formally blessed by Anglican rite. The arrival of protestant American missionaries represented the rise of not only settler colonial ideas about supposed racial purity and superiority, but also the rise of patriarchal values over the authority that women in Indigenous and Metis Catholic families exercised in their families and therefore over the business of the HBC. After the British relinquished the Columbia River valley and all of its lands south of the 49thparallel, in 1849 James left Fort Vancouver and moved HBC headquarters up to Fort Victoria on Vancouver Island, where in 1851 he was named both the governor and the chief factor for the HBC. In 1858 he became the governor of all of British Columbia. Fun fact! As you may have guessed from my Colorado-based cowgirl-themed blog, I love the efforts of people in cyberspace to bring a sense of place to their online personae and writing. True to its name, Borealia –meaning (loosely) northern stuff–published this review at 7 a.m. Atlantic time, three hours ahead of where I am in the North American Mountain time zone. Wherever you are waking up this morning, look to the northeast edge of the Americas and check out Borealia. ← Know anyone at Evergreen State? I have some thoughts, but want to know more. Very interesting. A multi-generational, hemispheric-wide multi-local story, apparently built around complicated actual people, more than factors, forces. How, when, and by whom did the guy get knighted? When he became governor? This stuff intersects, if only in very limited, but interesting degree, with some things that I am doing or trying to do. (Although I do have one *very* tiny veer into Demerara in my kit bag. I had to Google Map it!). Interesting, too, (this from the “whole thing” version of the review) about the coloniality of Old Empire U. Press book pricing. Could this study have been published, perhaps with lower material production values and less curb appeal prestige-factor, by a press out of Toronto, or Vancouver, or even Winnipeg, that might have been able and willing to sell more copies at lower prices? Or maybe this is a false comparative? In my observation, Canadian uni press books in my field generally have lower production values, yes, but they’re still very expensive (and frequently require a subvention to subsidize their publication), because Canada is a smallish country with not all that many universities & so uni presses don’t count on selling many copies. I think in going with CUP Perry wants people other than Canadian historians to read & appreciate her work, and it’s a strong series she’s in. My criticism was aimed at CUP for pricing their books like that without (I’m guessing) trying to market the books more widely & aggressively. I think Perry’s book & arguments not only complement and extend the research done by Jennifer Brown & Sylvia Van Kirk, the other historians of women in the HBC, but also the work of Susan Sleeper-Smith, Hyde (as I suggest), and other historians working on now-U.S. spaces and in U.S. archives, not to mention all of the happy Caribbeanists in the islands and London, etc. I think you’re right; that was the burden of my “false comparative” qualification, if badly phrased. Just going from this review, studies like this suggest how projects can be framed along all sorts of unusual trajectories across space as well as through long durations of time. There’s so much material out there in drowsy record groups that don’t have any way of calling attention to themselves until curiosity comes calling. A commonplace observation, perhaps, but there are some totally crazy stories out there that will never be located by deduction from historiographical structures of debate.